Earlier this month we released our new Chrome extension which is part of the Merch Informer family of research products: The Merch Informer Book Hunter. This has already been a great source of easy, unsaturated niches that you can use on Merch by Amazon by using SOCIAL proof! The entire idea was to find ideas off of Amazon (on social media instead), and get some social proof that these niches have customer demand. Bringing fresh ideas onto the Merch platform with your own designs in niches which demand is such an easy way to make sales. If you are unique (but there is demand in those niches), this makes your products stick out, and leads to sales! While this was already easy, we decided to make it even better! If you have not already, make sure to grab the plugin from the Google Chrome store here: https://chrome.google.com/webstore/detail/merch-informer-book-hunte/nhaniflhedjjeomiajkheofdaeeabfgg. This plugin is free for everyone who has a Merch Informer login (try out a 3 day free trial today)! After you have downloaded the plugin, click on the icon in the upper right hand corner of your Chrome browser and log in! Note: Turn off your ad blocker, and restart Chrome if it does not instantly show up for you. If you are not familiar with how everything works, please head over to our release article here. For those that do, this will look a bit different. We got rid of all the different modifiers in a drop menu and added a spot to add YOUR OWN KEYWORDS! With the new option to enter in your own keywords, this makes finding untapped niches even easier. 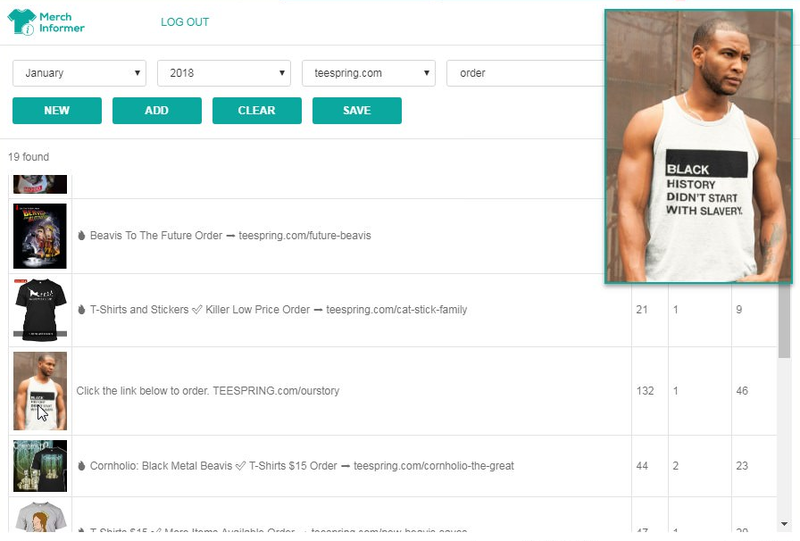 Lets just select January of 2018, and then teespring.com as our site of choice. For our unique keyword, I will simply put in “order”. Since many amateur sellers simply post on social media and just say “order – LINK HERE”, this will pull back a lot of interesting niches for us. Click on “New” which will rip through a search and bring back lots of targets. This took about 15 seconds, let’s take a look into the competition on Amazon. First thing I will check is how many designs are actually up (not how many are selling). This will give us an idea of just how many shirts are on the platform, in absolutely no order at all. Under 100 results, and half of them are from the same guy (with a different saying completely). Now, let’s pop into the Merch Informer software and see how many of these are actually actively SELLING! 18 shirts actually selling. EASY! While the average BSR is a bit high, this type of niche takes off during black history month, so it only makes sense. The point here though, is how easy it is to get off of Amazon, then bring results back onto Amazon and see what is for sale. If there is demand, come to the table with something UNIQUE! Finding these with the updated Book hunter is literally easier than ever. Good luck and have fun with the update! Download the extension, click it to log in. After you are logged in, restart Chrome. Once chrome is restarted, go to FB and click on it again and it should open. This looks great! But I did all the above steps and nothing happens when I click on the extension while on FB. Any ideas? Did you restart Chrome and turn your adblocker off? Why do your extensions need to read search history? I don’t see any need for that.. The extension performs a search on behalf of the user and it needs to be able to sort the data based on the said search.